A clique of the Buddha’s monks taunted and insulted other monks when they disagreed with them on something. When the Buddha was told about their behavior he scolded them and then told them this story of one of his past lives so they would understand that speaking with kindness rather than hostility is beneficial. The Buddha-to-be was born as an ox. His owner named him Nandivisala and treated him like a member of his family, always feeding him the best rice. Nandivisala grew up exceedingly strong and completely loyal. He greatly appreciated being so well cared and wanted to show his gratitude. He told his owner to make a bet with someone that he could pull one hundred loaded carts. 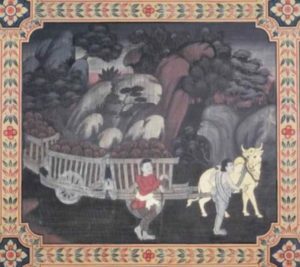 A rich merchant took the bet and Nandivisala’s owner loaded up the carts and harnessed Nandivisala at the front. To begin, the owner pulled out his goad and shouted “Go, you rascal! Pull them, you rascal!” But, upset by the name calling, Nandivisala didn’t budge. The owner, depressed at having lost almost all his money, returned home and lay down in grief. Nandivisala told his owner that the failure was his own fault. He had never broken anything, brushed up against anyone, or made a mess, so there was no reason for the owner to insult him. His lesson delivered, Nandivisala told his owner to go double or nothing on the same bet. This time to begin, the owner stroked the Buddha-to-be’s back and called out “Go, my fine fellow! Pull them, my fine fellow!” And this time the Buddha-to-be walked until the 100th cart had arrived where the first cart had started, and the owner got the money.